If you’ve taken Automator out for a spin, you know that Apple’s automation tool really does make it easy to simplify repetitive tasks. But after experimenting with its built-in actions and with actions culled from the Internet, you probably still wish you could do more. Luckily, lots of other automation tools work flawlessly with Automator. Put them together, and you’re ready to shift into high gear. Of course, AppleScript is a little geeky (it’s a programming language, after all), but it’s got more power than a Porsche—and that makes it a perfect complement to Automator. (To get up-to-speed with Automator basics, see Take Control of Customizing Tiger. For AppleScript basics, see Amazing AppleScript!.) Link the two by using Automator’s Run AppleScript action. That way, you can take advantage of the drag-and-drop ease of Automator for the simple stuff, and use down-and-dirty AppleScript code for the hard stuff. Enjoy the Weather Here’s how you’d use these tools to put a current weather map of the United States on your desktop. Launch Automator (/Applications). Then drag the Automator: Run AppleScript action into the pane on the right of the Automator window. 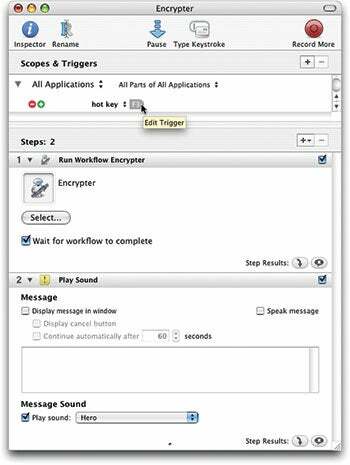 One-Button Workflow Combine QuicKeys and Automator to trigger complex workflows with one keystroke. If you’d like your shortcut to work only in certain programs, use the All Parts Of All Applications pop-up menu. Drag the Finder: Get Specified Finder Items action to the bottom of your Automator workflow. Click on the plus-sign (+) button and navigate to the weathermap.jpg file on your desktop. Click on Open. (This tells Automator that you intend the rest of your workflow to operate on the weather map file.) Now drag the Preview: Pad Images action to the end of your Automator workflow. A dialog box will ask whether you want to make a copy of the image. Click on Don’t Add. Fill in the width and height of your screen in the appropriate text boxes. (Find yours by opening the Displays preference pane and noting which item is selected in the Resolutions list.) Select the Scale Image Before Padding option to ensure that your image fits the screen just right. Automator actions that control Microsoft Office 2004 ($399) are exceedingly scarce. But it’s easy to record a macro (shortcut) in an Office program and then link it to an Automator workflow. The trick is to use a short AppleScript as the mediator. Create a Secure, E-mail-Ready Archive Using some tricks from the previous workflow, the following procedure produces a workflow that automatically password-protects and compresses your frontmost Microsoft Word document. First, launch Microsoft Word and open a document that you’d like to encrypt. You’ll password-protect this document once to teach Word how to automatically password-protect any document. in the Macro Name text field. Click on OK. Now Microsoft Word is recording everything you do. Choose Word: Preferences, and then click on Security in the list. Type the password you want to use in the Password To Open text field. Word will now require this password when anyone tries to open the document. Click on OK and then confirm the password. Choose File: Save, and then choose Tools: Macro: Stop Recording. , into the Save As field. From the pop-up menu, select the location where you want the archives to appear. Make Workflow Magic As helpful as your last workflow is, it still requires that you switch out of Microsoft Word, launch Automator, and click on Run. A QuicKeys shortcut will save you time. Open QuicKeys and choose Create: Scripting: Workflow. An Untitled Shortcut window will appear. Click on Select, and navigate to the Encrypter workflow you just saved. Click on Choose. Click on the plus-sign pop-up menu in the middle of the window on the right side, and choose QuicKeys: Message. When QuicKeys completes a workflow, it doesn’t let you know; if you want some feedback, select the Play Sound option here and pick a sound from the pop-up menu. , for example), and click on OK.
That’s it! Now, as long as QuicKeys is running, whenever you press your hot key, your Automator workflow will spring into action—encrypting and compressing the current Word document.